One of my friends recently read The Life-Changing Magic of Tidying Up and tore into her own apartment with gusto. When she finished going through her books, she had four boxes of things to give away. One went with her to work, to let her clients pick through them. The other three came home with me. This might sound counterproductive to what I’ve been trying to do, but I promise it wasn’t. She knows I’m a book fiend and have plenty of bookish friends. Whatever I didn’t keep for myself would get passed on to the next person… and the next and the next. Her books would find new homes along the way. I surprised myself and only kept 6 books for me! Two were classics, Hemingway’s “The Old Man and the Sea” and Faulkner’s “As I Lay Dying” that somehow I didn’t already own. One is a book on writing memorable letters, which is the sort of book I will read and may or may not pass on again when done. I love letter writing and figured there might be something for me to use or think about inside. Another is a book on country style decorating. There were lots of decorating books in those boxes, but this one actually had several little projects that seemed both manageable and something I would realistically enjoying making. There was an older book in the bunch, “Indigo” by Christine Weston. I’m a sucker for older books and flipping through the pages I saw enough that made me curious to read it. Finally there was a book I had almost bought at an antique store just a couple of weeks earlier. (I didn’t want to spend the money at the time.) 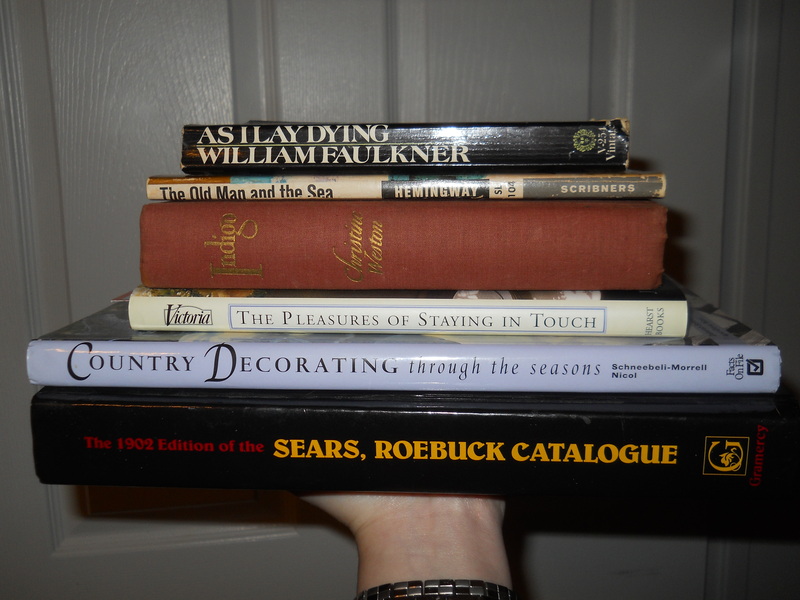 It was a hardbound facsimile of the 1902 Sears Roebuck catalog. We had an older copy of one of these catalogs in my house as a child and I loved looking through it. I’m happy to have a copy of it in my own home now too. Give me a few more weeks and I’ll be back for the next round of tidying!